Kathleen Hall Jamieson and David Birdsell’s President Debates – The Challenge of Creating an Informed Electorate is still the best book on presidential debates that has been written almost 20 years on. The title offers a clue why this book is such an excellent contribution: the authors desire a more informed electorate. This is the lens through which Jamieson and Birdsell critically examine the modern political phenomena; their critique of debates and recommendations about the future are dedicated to the purpose of creating a more informed electorate. There are several other aspects to this book that make it such an excellent contribution. First, the book never loses sight of the principles of debate. Secondly, the historical perspective does not start with the Kennedy-Nixon debates or the Lincoln-Douglas debates (as is the case with many other books on presidential debates) but with role of debates in universities, the education and legal systems and the formation of the American political system. Only then does it go onto look at the Lincoln-Douglas debates and modern televised debates. So strongly grounded in principles and history is this book that the reader feels very confident proceeding to a discussion of presidential debates, their strengths and weaknesses. It also makes the book ageless, which is useful since it was written in 1988. The book has a thorough examination of the impact and power of televised debates. There’s a particularly interesting section where the authors list and explain the ways in which broadcast debates assist candidates. Probably the most compelling chapters of the book are the final two chapters: The Problems of Broadcast Debates and The Promise of Debates. These two chapters pick apart the current malaise. They are appropriately critical and at the same time highly constructive. The only difficulty with this book is that it has not been updated in over 20 years. So it does miss much of the recent history of presidential debates, including controversies surrounding this Commission on Presidential Debates. Nevertheless, if you want to read a book about election debates, read this book before any other. Alan Shroeder’s Presidential Debates – Fifty Years of High Risk TV (2nd edition) is a comprehensive history of televised presidential and vice presidential debates. Shroeder has divided the book thoughtfully: pre-production, production and post-production. He covers all aspects of debates and misses little detail along the way. His discussion captures interesting issues such as pre-debate expectations and how these affect our perceptions of performance and post-debate spin. He also provides a critique of candidate performance, both presidential and vice presidential, from John F. Kennedy (1960) to John Edwards (2004). The book is made all the more engaging and entertaining by Shroeder’s capacity to relate personal stories, recount particular conversations and link debates to the political issues of the day. The one criticism of this book is that it is not critical enough. While there is a final chapter on improving debates, it does not advocate much change. Shroeder does not reconcile the conflicts that have developed over the fifty years of debates between candidate, media and public interest. It is this conflict that is the basis for much of the criticism levelled at the debates and the debate sponsor, the Commission on Presidential Debates (CPD). Instead, the author seems fairly dismissive of CPD criticism and overly appreciative of the candidate’s aversion to risk, which is slightly odd given the name of the book. That is the only real criticism of the book. It is otherwise an engaging historical view of presidential and vice presidential debates that will undoubtedly make the reader feel more knowledgeable about this political phenomenon. George Farah’s No Debate – How the Republican and Democratic Parties Secretly Control the Presidential Debates is a vital contribution to the field of books about televised leaders’ debate. While most presidential debate authors advocate some reform of the system, this book takes off the gloves and argues that US presidential and vice presidential debates are broken. It is direct and aggressive and a welcome contrast to the more academic texts on the subject. Yet it is grounded in strong analysis and therefore very persuasive. Farah launches a strong attack on the seemingly independent Commission on Presidential Debates (CPD). He attacks its heavy bipartisanship. As he points out, the CPD board and executive are generally either Democrats or Republicans. No Debate suggests that the CPD excludes minor party candidates and challenging formats in order to protect Democrat and Republican interests. Perhaps the only institution that Farah could have examined in more depth is the US media. Presumably the media is both compliant with the CPD on one hand, while being a lifeline to robust candidate questioning on the other. A more detailed examination of the media’s role would have completed this book. This is an accessible and compelling read for anyone interested in election debates. Newton N. Minow and Craig L. Lamay’s Inside the Presidential Debates – Their Improbable Past and Promising Future is the insider’s book. From his early days alongside John F. Kennedy to his later contribution as vice president of the Commission on Presidential Debates (CPD), few have had Minow’s access. The book is covers the history of televised leaders’ debates, describing how the first Kennedy-Nixon debates came about to the entrenchment of more regular debates from 1976. The book covers speaker eligibility issues and the regulatory environment. The strength of this book is also its main weakness: the insiders are simply not critical enough of the phenomenon they have helped orchestrate. The authors excuse the perceived weakness of the CPD in dealing with the major parties on the grounds that if it does not tread carefully there will be no debates at all. They claim that the CPD is diverse (based on its ethnic and gender composition) but ignore the real claim about its lack of diversity – that it is comprised mainly from Democrat and Republican ranks. Similarly, the final chapter on improving presidential debates contains some useful suggestions but is simply not critical enough of the scripted, stilted debates of today. The book is easy to read and quite brief (80 of the 200 pages are comprised of appendices and notes). The insider’s perspective is interesting, yet those wanting a better critique and more compelling plan for the future may be disappointed. Election Debates’ experts contribute to a number of respected debate publications. The Australia-Asia Debating Guide covers three-on-three debating, with chapters on British and American Parliamentary debate. This Guide is used as the Rules for most Australian state competitions, the Australian National Championships, the AustralAsian Debating Championships and numerous other regional and national competitions. 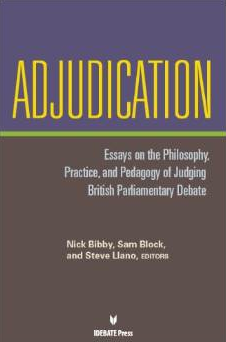 Adjudication is a collection of essays reflecting on various aspects of the role of adjudicators in competitive debate. Although its focus is competitive debate in the British Parliamentary format, it contains insights and reflections that should be of use to any adjudicator, coach or debater. It discusses contemporary challenges in adjudication in terms of both the general theory underlying the role, its use as an educational tool, and some of the very real and practical issues facing judges. The book addresses the fundamentals of three-on-three debate and is ideally suited for beginners, particularly beginners for whom English is not a first language . It is edited by Professor Brendan Howe. Election Debates’ Ray D’Cruz and Jason Jarvis author chapters in the book. Ian Lising, former WUDC Chairman and Election Debate expert, applies his 20 years of WUDC experience as a debater, judge, coach and administrator in this 2010 edition. The book is accessible for debaters new to parliamentary debates and while providing thoughtful analysis for more experienced debaters. These Rules, also known as the World Parliamentary Rules are the rules for many international, regional and national parliamentary competitions. Competitions governed by these rules include the World Universities Debating Championships and World Masters. Ray D’Cruz is the author of these rules.